Note: Abridged audio reading of Barry Letts' autobiography, originally released as a downloadable e-book in 2007 and later published as a "real" book. Despite the reference on the cover blurb to this being the first volume of his memoirs, sadly there was no second volume — Barry Letts passed away in 2009 before continuing work on his memoirs. Barry Letts was the producer of Doctor Who from 1969 to 1974, executive producer in 1980, and later producer of the BBC's Classic Serials strand. His career started as an actor, and he switched to directing in the 1960s. 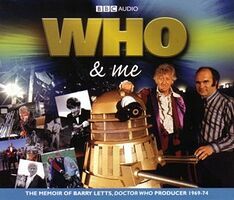 Focussing on his tenure as Doctor Who producer up to 1974, Who and Me recounts the journey Barry took from struggling actor to successful producer, and the ups and downs of working on Doctor Who during the Jon Pertwee years. Along the way, Letts describes how he came to be director and then producer of Doctor Who, what it was like to do those jobs, and the personalities he worked with during that time — from his script editor Terrance Dicks and the stars of the series, to the senior management of the BBC with whom he had several encounters. We learn how the character of the Master came into being, how Katy Manning came to be cast as Jo Grant, and how some of the most memorable stories, such as Inferno and The Daemons, were created. Filled with humour and fascinating insight into the inner workings of the much-loved show, this is one memoir that all fans of classic Doctor Who will want to hear.